A sweet smoke curled around the stones of St. Elizabeth Catholic Church on Sunday, after perfuming dozens of slabs of pork ribs destined for Kansas City Super Bowl parties. The meat — prepared by a Waldo-area barbecue team — was sold to raise money for the Foundation for Inclusive Religious Education, a group that helps defray the cost of special education at a dozen area Catholic schools. The foundation was started by six families almost two decades ago to help special needs students who wanted to go to a parochial school. It has grown to provide direct help for dozens of students and to subsidize paraprofessionals who work with hundreds of others. Sunday’s barbecue sale, dubbed a drive-by ribbing, was expected to raise more than $1,500 for the cause. The group spends more than $200,000 on program services each year. 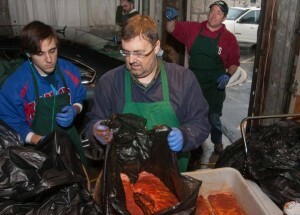 The rib smoking team began its work early Sunday in the church parking lot at 75th and Main streets. The slabs were sold for $17 each, then delivered to customers driving through the lot. Organizers said they prepared 230 slabs for Super Sunday consumption. Catholics waiting to pick up their orders admitted they’re more accustomed to chili fundraisers or Lenten fish fries. But of course this is Kansas City. Joel Jones said chili and fish are occasionally on the St. Elizabeth menu, but smoked ribs are a favorite. “I pretty much buy anything they have to sell,” he said. To reach Dave Helling, call 816-234-4656 or send email to [email protected].